To live a decent life in Washington, it costs a single adult $10.77 an hour. Yet one-third of all job openings pay less than that, according to a study conducted by a Seattle organization. 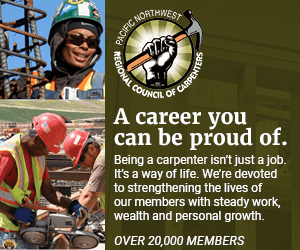 "Searching for Work That Pays: The 2005 Northwest Job Gap Study" determined that the "Northwest is not creating living-wage jobs for all those who need them." When families cannot earn what they need to survive, the study notes, "many are forced to make difficult choices between adequate health care, balanced nutrition and paying the bills." The study was prepared by the Northwest Federation of Community Organizations, a regional federation of four statewide, community-based social and economic organizations. It encompassed Oregon, Washington, Idaho and Montana. Of the four states, Oregon and Washington had the highest living-wage requirement to pay for day-to-day needs. A "living wage" is based on what is needed to meet basic needs and maintain some ability to deal with emergencies and plan ahead, according to the study. To determine the costs in each state, the federation used data collected by federal and state agencies, including the U.S. Department of Agriculture, the federal Department of Housing and Urban Development, the U.S. Department of Transportation and statewide child care surveys. Items included in a family's budget included housing and utilities; transportation; health care; child care; household, clothing and personal expenses; savings; and state and federal taxes. • Two adults (two working), with two children $28.32 an hour (the combined wages of both working adults needs to total this amount), or $58,907 yearly. It costs just slightly less to live in Washington than in Oregon, except for those living in King County, the study indicates. While a living wage for a single adult in Washington averages the same as Oregon's — $10.77 an hour — King County residents must earn $11.89 an hour to survive. A single adult with two children in King County should earn $25.35 an hour — $3 an hour more than for the same households throughout Washington; for them, it takes $22.35. • Two adults, both working, with two children: $28.72 hourly, or $59,732 yearly. But job seekers in both Oregon and Washington are finding that much of the time the available jobs don't pay enough to support a household. In Oregon, 38 percent of all job openings pay less than the $10.77 hourly wage required by a single adult. For the single adult with two children who needs $22.37 an hour, 85 percent of the available jobs don't meet those standards. The situation is only slightly better in Washington: 32 percent of the available job openings pay less than the $10.77 hourly required by a single adult, and 77 percent pay less than the $22.35 needed by an adult with two children. Despite the lack of pay, however, competition exists for jobs. In Oregon, six people are seeking the same job that pays at least $10.77 an hour, and in Washington an average of four people are vying for that job. For jobs paying at least $22.37 an hour, the living wage for a single adult with two children in Oregon, there are 26 jobseekers on average; in Washington, there are 12. Paying for health care is at the core of the problem in keeping up with the cost of living, said Will Pittz, regional organizer for the Northwest Federation of Community Organizations. Pittz is one of the three authors of the study. "What we know is that the costs of living are rising particularly because the cost of health care is rising much faster than wages," Pittz said. "We have a situation where there will be more and more people who won't be able to pay for their basic needs." Two things need to happen, he said: Government needs to expand health care options and employers need to be accountable to their employees and provide access to health care. Even if a company does provide health insurance, at least one-third of the employees aren't covered either because they can't afford the premium they have to pay or they aren't eligible because they are part-time or temporary workers, the study says. In Oregon, 40 percent of the nonelderly population does not have employer-based health insurance, according to the study. Of those, 7 percent purchase private health insurance, which often doesn't cover vision, dental, mental health or substance abuse treatment; 14 percent are covered by Medicaid; 1 percent are covered by Medicare; and 18 percent go uninsured. The statistics are similar in Washington. Minorities also are disproportionately represented among the uninsured, the study notes. Nationally, while only 14.5 percent of Whites are uninsured, 36 percent of Latinos, 21 percent of African Americans and 20 percent of people of other races go without insurance. The study concludes that the disparities can be attributed to the "segregation of people of color into low-wage occupations and job sectors where fewer employers insure their workers." Government also needs to expand health care coverage for those who earn minimum wages, said Pittz, who noted that the Oregon Health Plan is an example of what other states could do. "There's a huge and growing gap between employer-supported and government supplied health care," he said. When they are trying to decide between eating and paying health insurance, "one of the things people tend to trade off is health care," Pittz added.